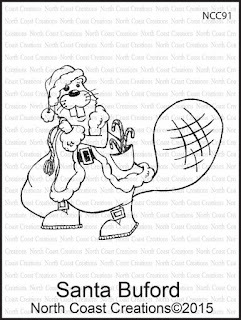 Santa Buford is Coming to Town! Hi there! I made this card for the CAS challenge on Splitcoast to use a Christmas (or any holiday) critter! 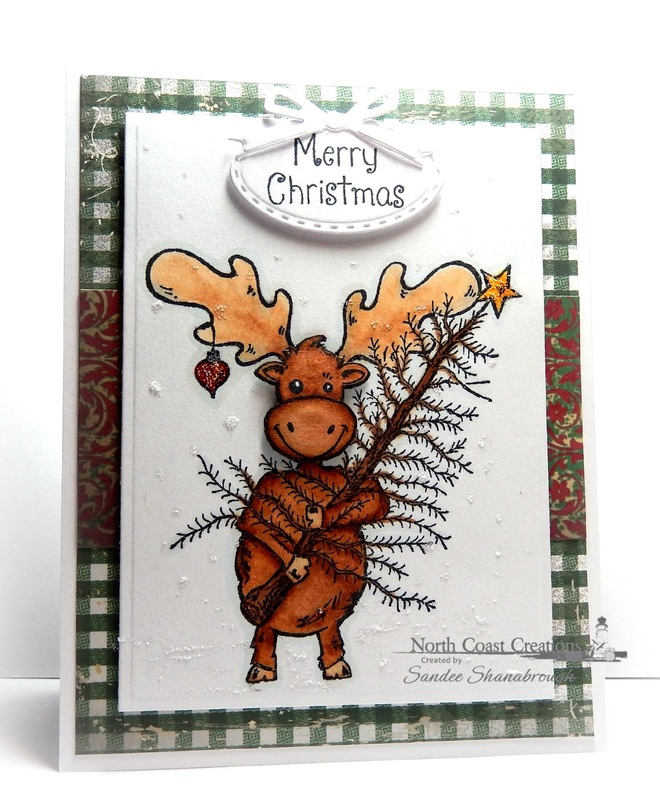 The new Santa Buford from North Coast Creations fits the bill! I colored him with copics and cut him out. 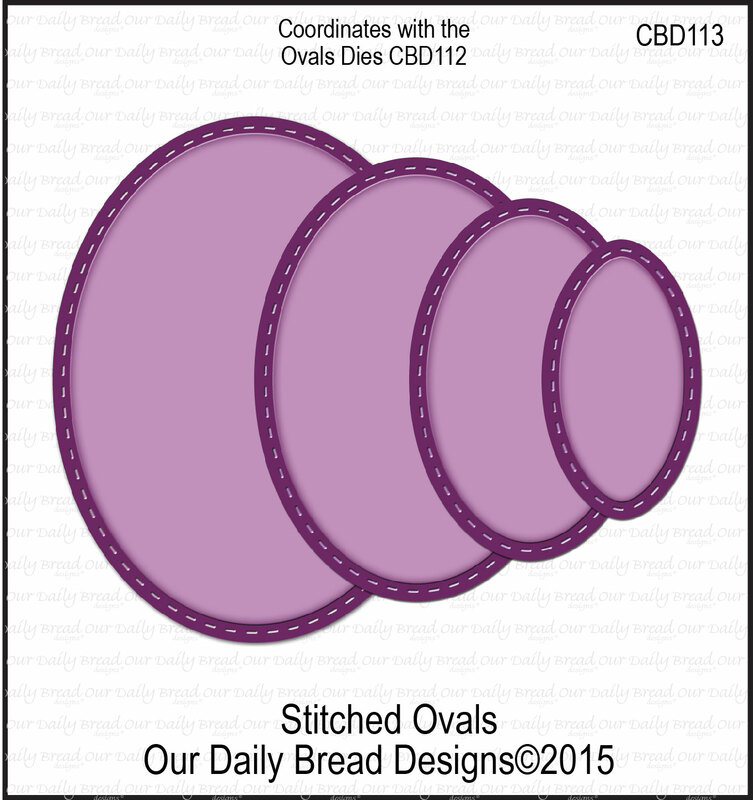 He is popped up over an ODBD Oval and Stitched Oval. The background is a piece of designer paper from the ODBD Christmas Collection 2013 on an ODBD Flourished Star Pattern die cut. 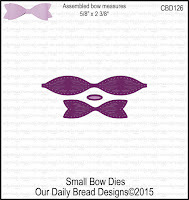 The sentiment is from the NCC Snowman Family and is on an ODBD Pennant with a bow from the ODBD Circle Ornaments dies. 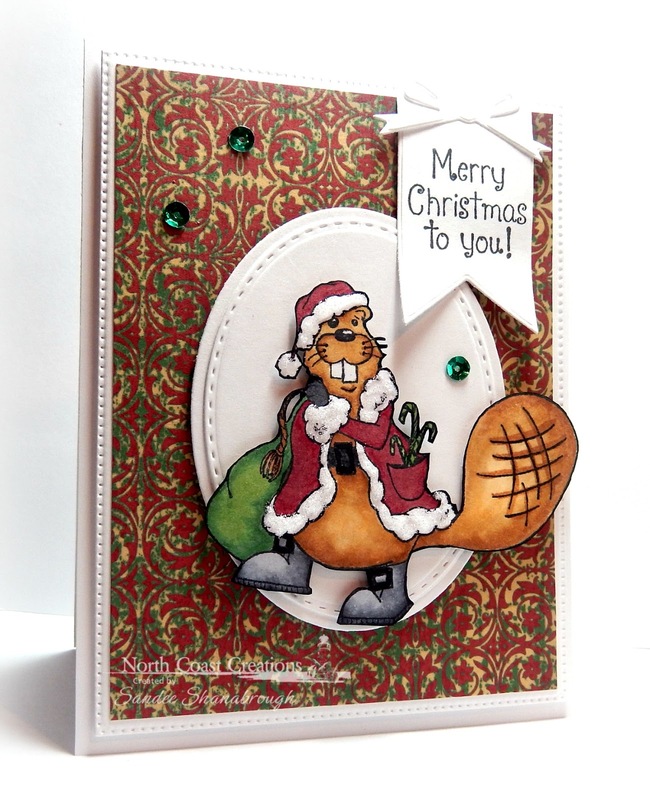 I added stickles to Santa Buford's coat and hat and finished the card with three sequins. 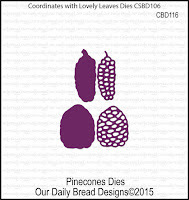 Looking Back at the November ODBD Release! 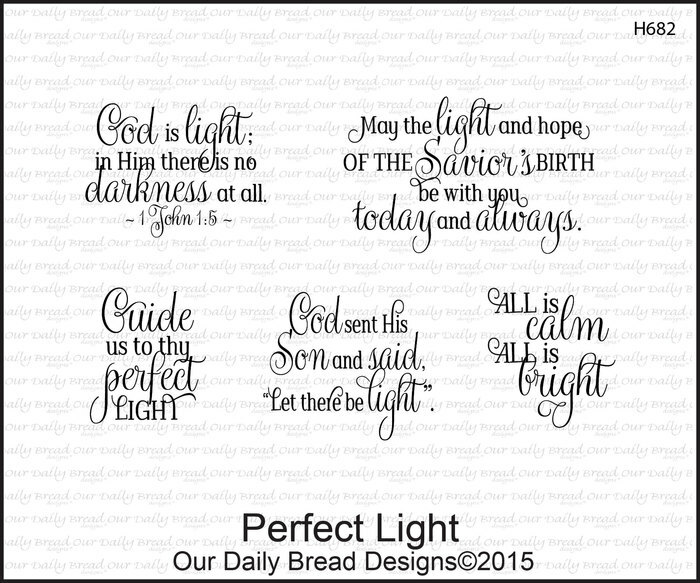 November release from Our Daily Bread designs! I am really lovin' all the new dies y'all! 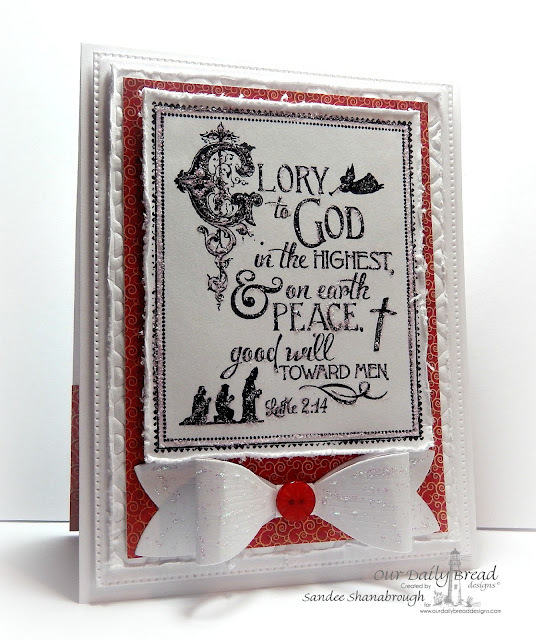 There is no stamping on this card! I added stickles for a little sparkle! 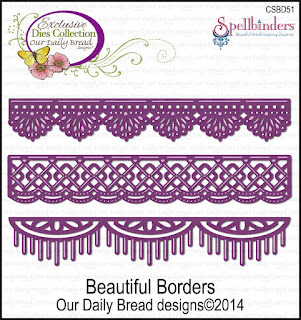 go check out these projects created by my DT sisters! I made this card for Inspiration Challenge at Splitcoast #519 today! 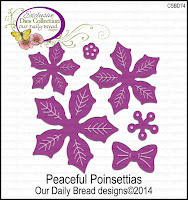 Our inspiration is a Pinterest board belonging to the amazing Angela Maine! I chose THIS photo for my inspiration. 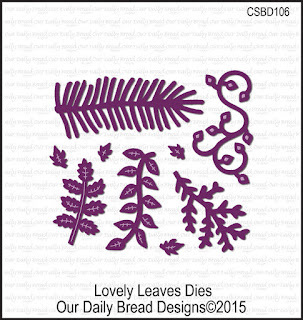 The sentiment is from a new stamp from Our Daily Bread designs called Born This Day and is cut out with an ODBD Oval die. 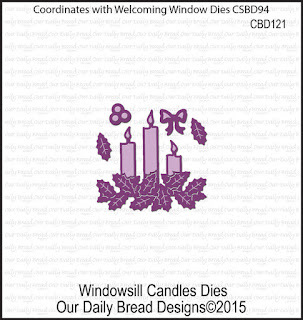 I created a mantle using a strip of card stock, an ODBD Beautiful Border die cut, some ODBD Lovely Leaves die cuts, and some ODBD Windowsill Candles die cuts! 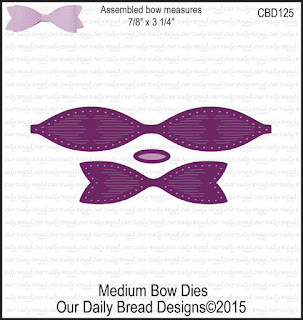 I added the ODBD Small Bow die cut to the center of the 'mantle'. 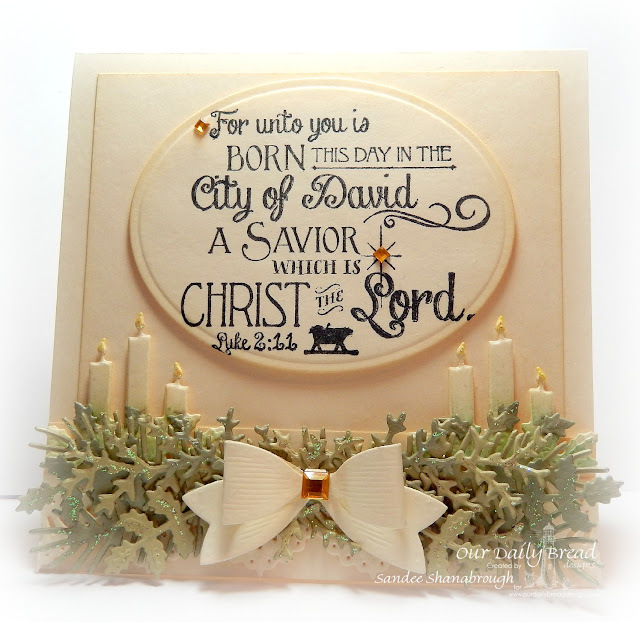 I finished the card with stickles and some gold rhinestones! This card is for the Sketch Challenge at Splitcoast this morning! 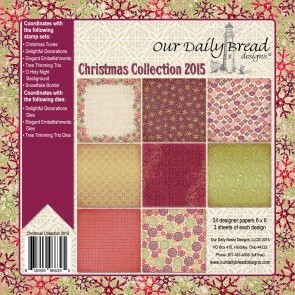 This designer paper from Our Daily Bread designs is fantastic for those quick Christmas cards to add to our stash! 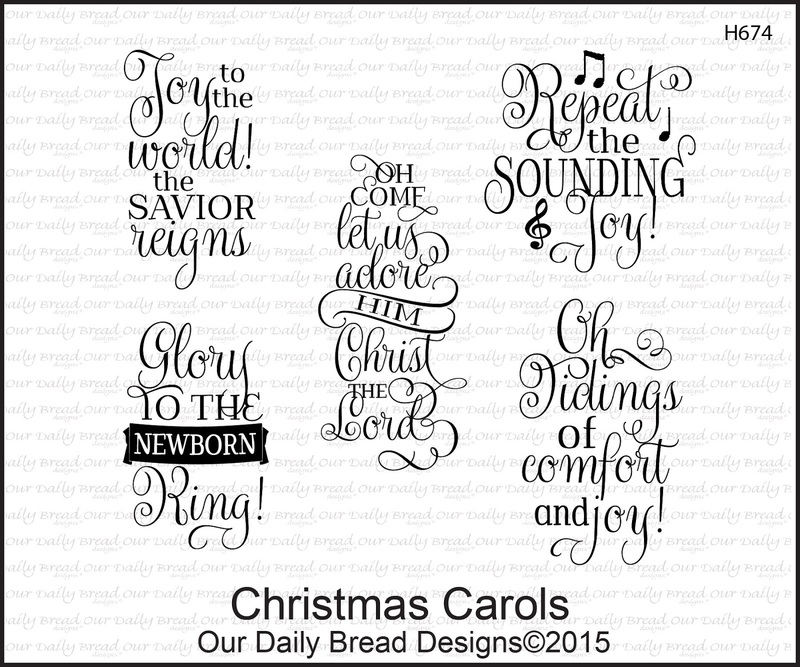 The paper pack is called Christmas Card Collection 2015! 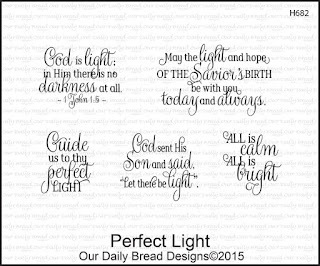 The sentiment is from Perfect Light. 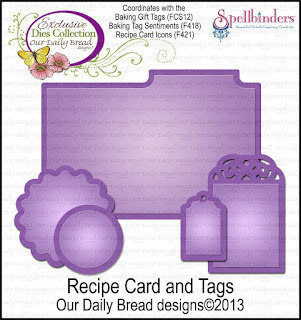 I cut the sentiment out with the circle die in the Recipe Card and Tags die set. 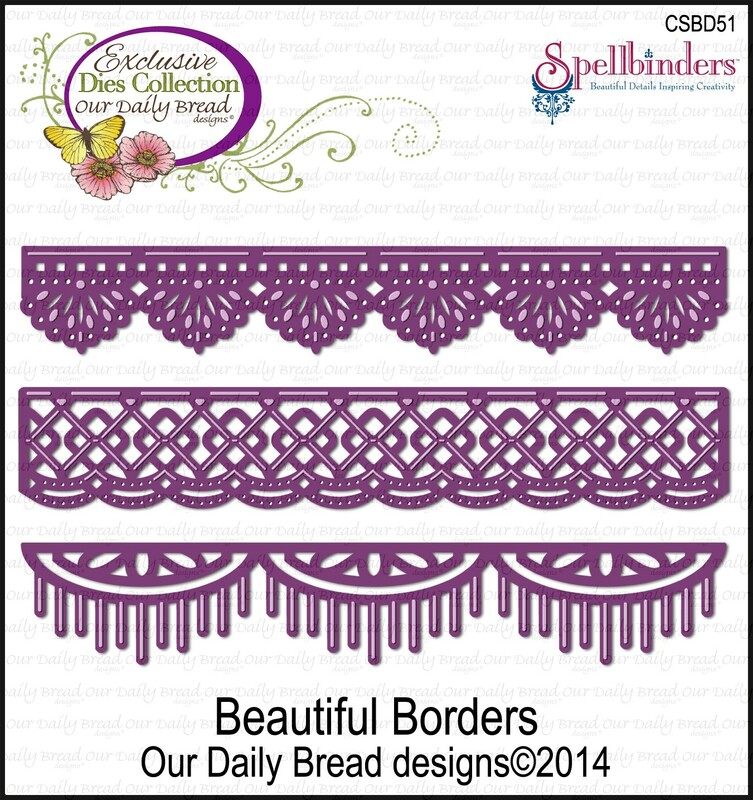 And the lacy edges are cut with a Beautiful Borders die. 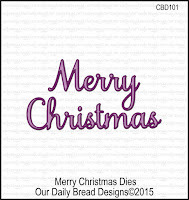 A quick and easy card! 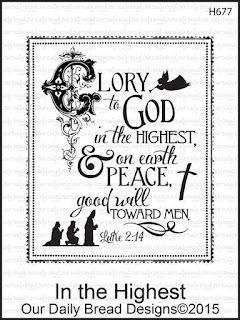 This sentiment is from the Christmas Carols set and is cut out with and Oval die and layered onto a Stitched Oval die cut. 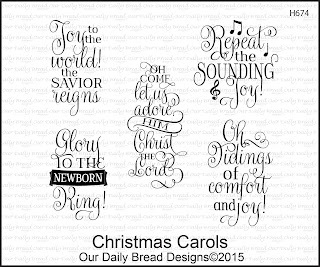 The designer paper is from the Christmas 2015 Paper Pad. The outside rectangle is cut with a Flourished Star Pattern die. I had a chance to play in the Color Challenge at Splitcoast this morning! I came as close as I could to the colors of Tempting Turquoise, Real Red and Primrose Petals. 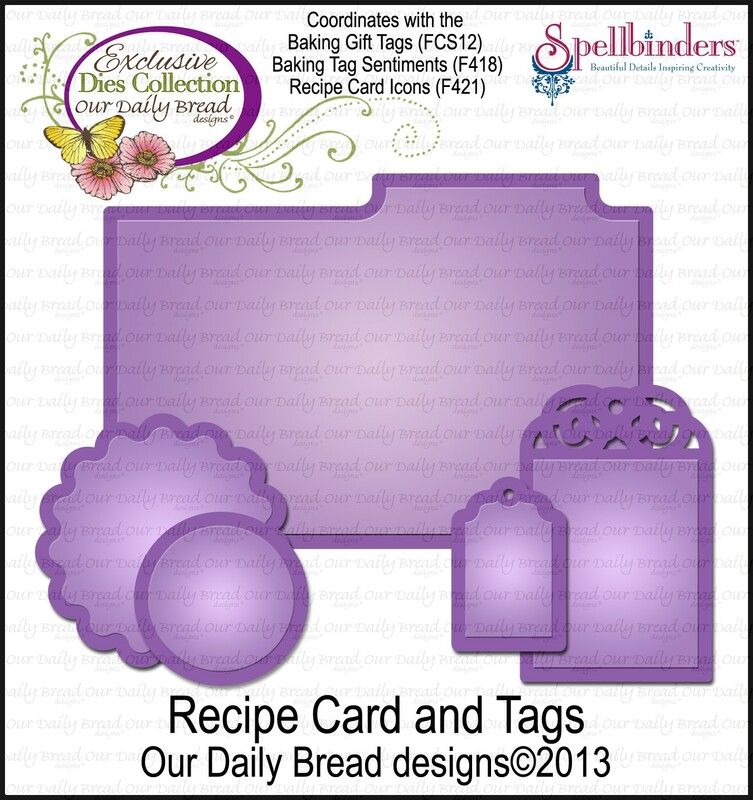 And the dessert option is to use a tag! 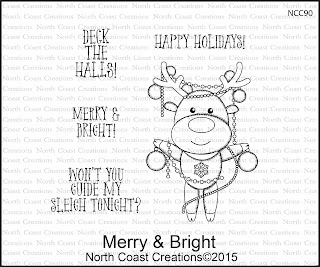 I used this cute North Coast Creations set called Merry and Bright! I colored the image with copics and used stickles to add a little sparkle. I cut out the image with an ODBD Oval. 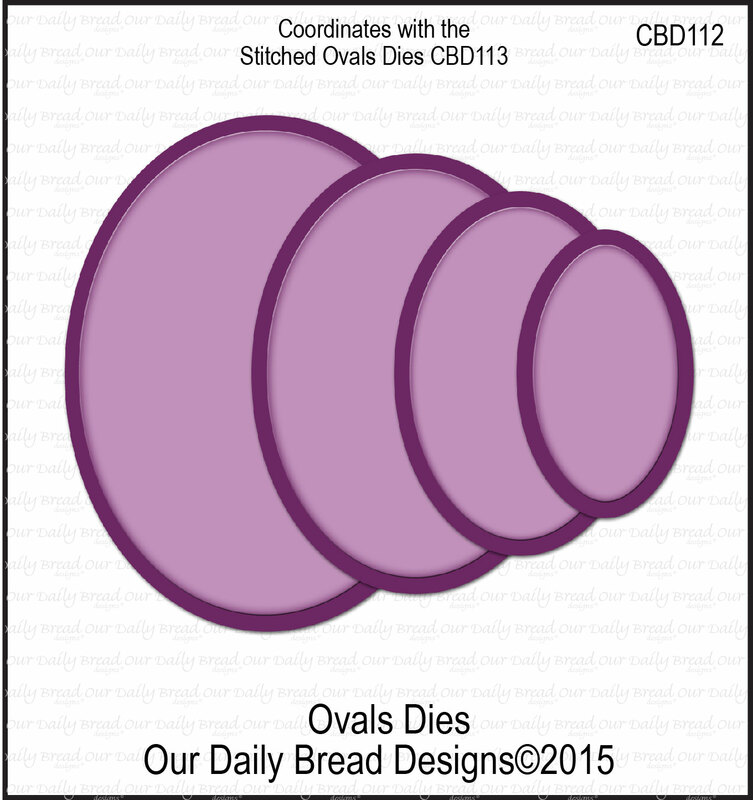 The tag is cut with an ODBD Recipe Card and Tags die. 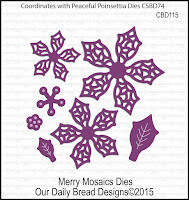 The snowflakes are actually the centers of the poinsettias in the ODBD Merry Mosaics dies. 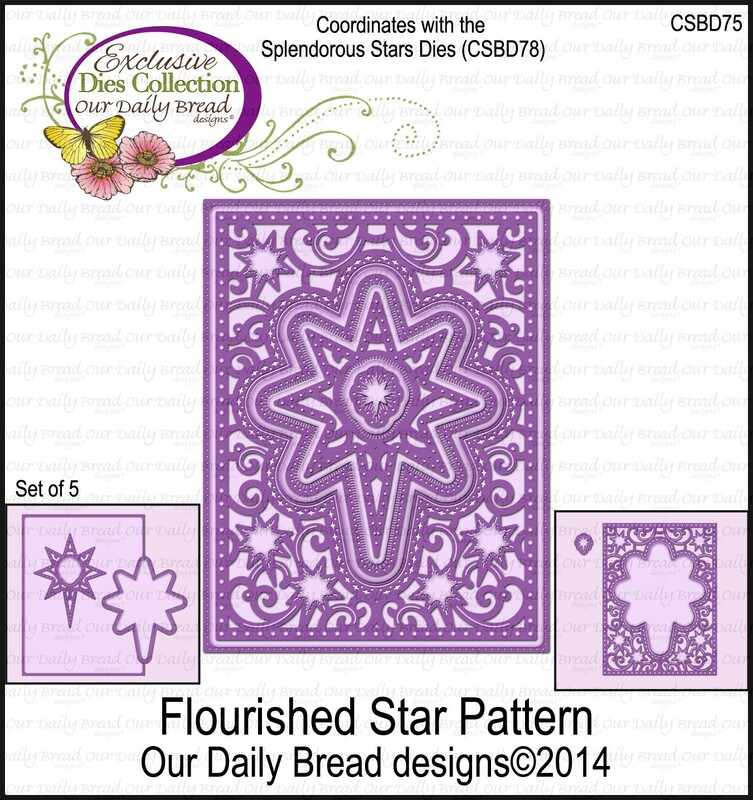 The large panel is cut with an ODBD Flourished Star Pattern die. I also cut a 'stencil' with the ODBD Boho Background die and sponged with Pan Pastels to create the blue background! 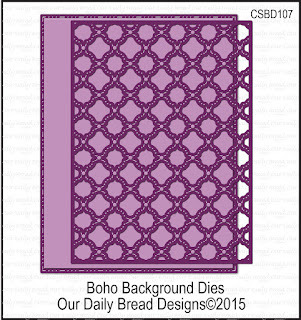 I loved that technique so much that I made a second card, this time sponging right through the ODBD Boho Background die! This time I used the adorable NCC Caroling Penguins! 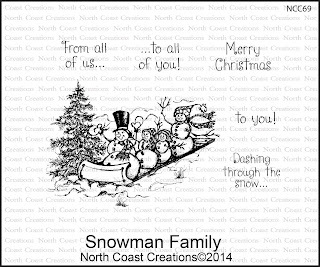 The sentiment is from the NCC Snowman Family. I colored the image and cut it out. 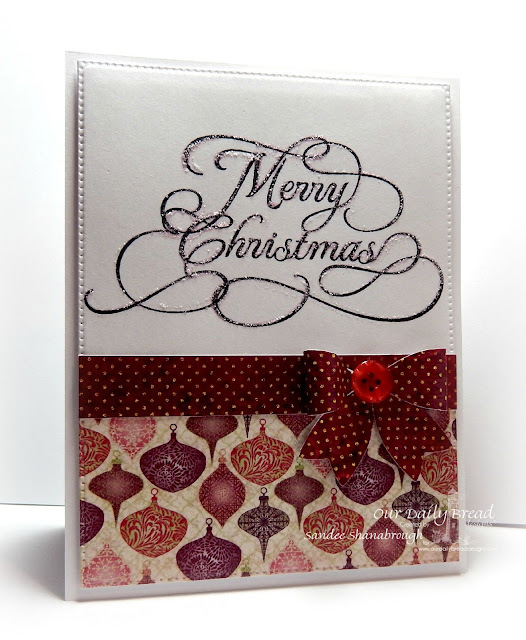 I stamped just the music notes on the background panel and popped up the cut out image under the notes. I added stickles for some sparkle. 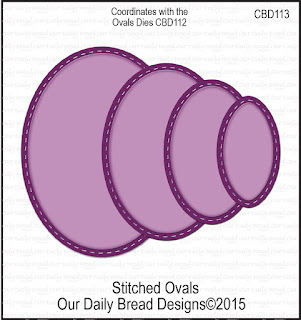 I also used an ODBD Stitched Oval die, an ODBD Circle Ornaments die, and an ODBD Leafy Edged Border die. Thanks for stopping by! Have a nice evening! 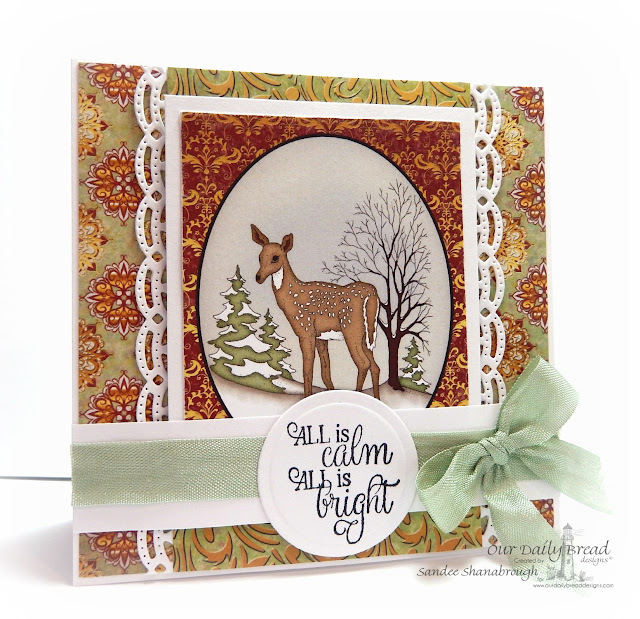 Welcome to the November NCC Release! 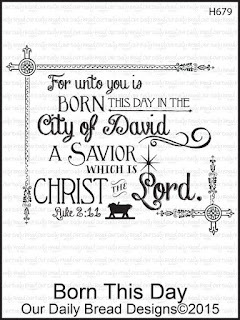 Thank you so much for joining us today! 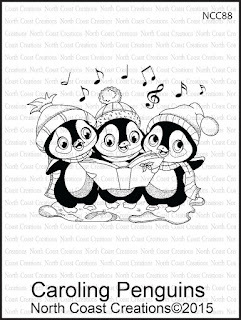 North Coast Creations has three adorable new Christmas stamps new for November! 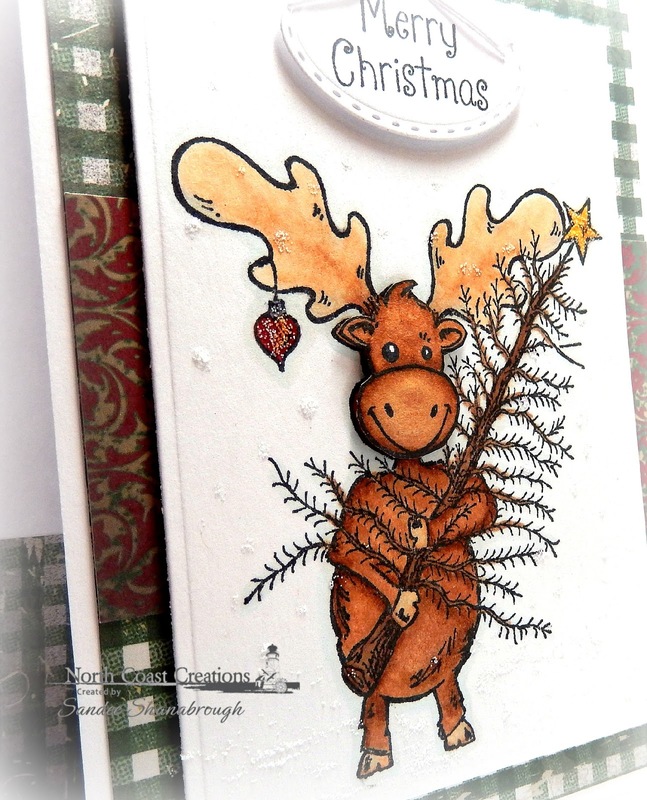 I love this moose! 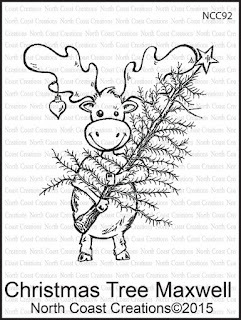 He is Christmas Tree Maxwell and he is so cute! I stamped him twice and colored him with copic markers. I cut out just the head of one of the images and popped it up over the main image. 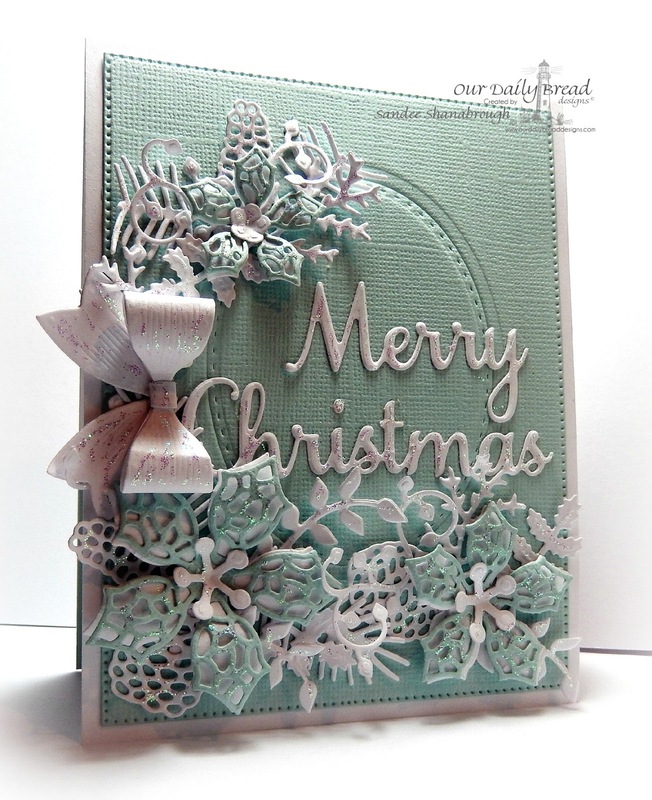 I layered this panel over ODBD Christmas Collection 2013 Paper. 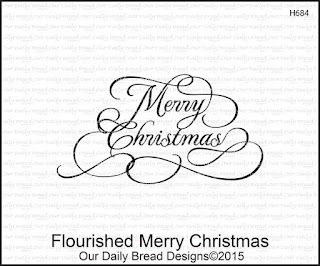 The sentiment is from Snowman Family and is cut out with an ODBD Stitched Oval. The little bow is from ODBD Circle Ornaments. 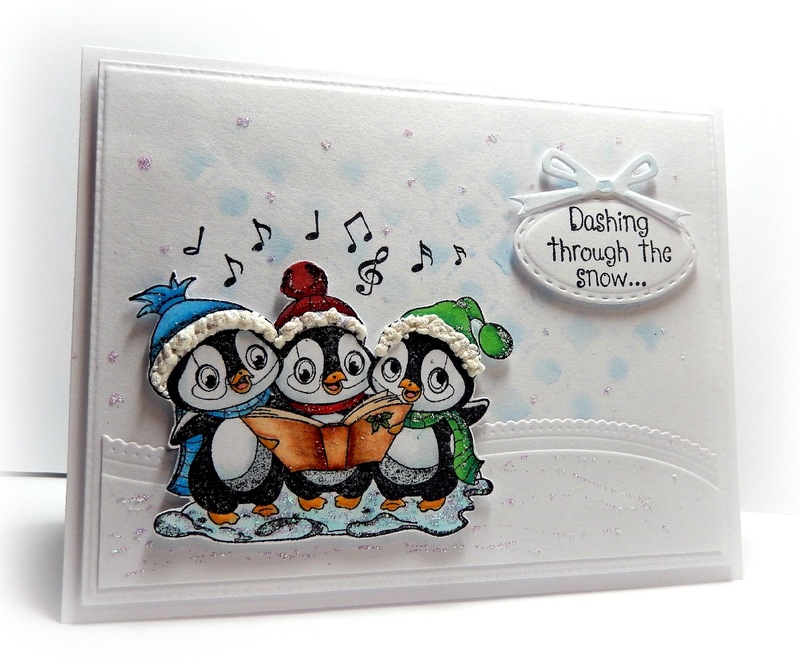 I finished the card off with Stickles for snowflakes. 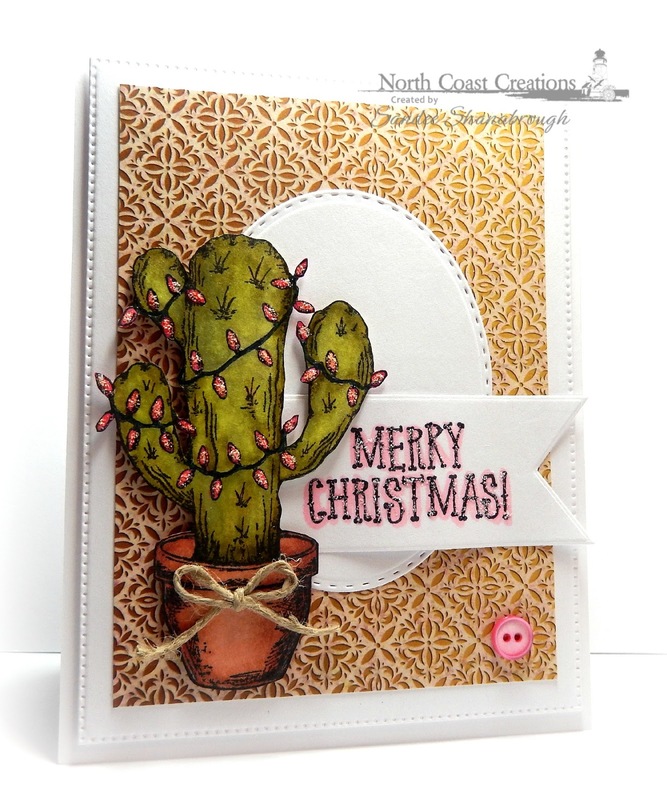 The new Cactus Lights set is a great set to have in your collection of Christmas stamps! 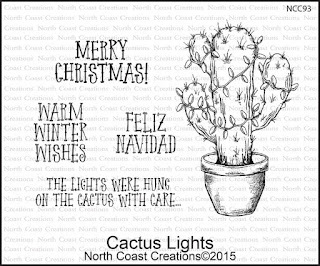 I colored the cactus image and cut it out. 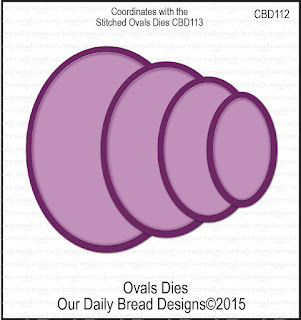 I popped it up over an ODBD Stitched Oval and tucked an ODBD Pennant with the sentiment behind it. The designer paper background is from the ODBD Christmas Card Collection 2015 paper pad. 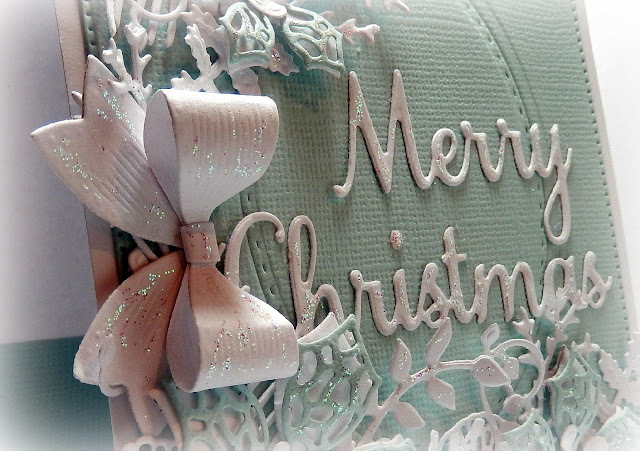 I added stickles to the lights, a tiny twine bow and a pink button to complete the card!